Problem with files and layers becoming corrupt. Using CS5. Issue happens to all file types I use (psd, tif, jpg, Cr2) in photoshop, Camera raw, and in Bridge. Before editing, during editing, or after saving and reopening a worked on file. There is no pattern to how this problem shows up. Problem files are not coming from a specific memory card, or a specific camera. I have tried adjusting photoshop performance preferences. nothing has helped. it also appears on both my laptop and desktop. Have you installed all the updates for Photoshop CS5 (you should have 12.0.4)? Have you checked your disk for problems? Have you updated your video card driver? Are you saving or loading these over a network at all? I havent checked myself, but I did have my desktop in the mac store for a separate issue and everything was checked then. Everything showed to be ok. It would be nice to get a copy of the file so we can see the layer structure and make-up. Can you post a copy somewhere for us to download and examine? It it almost 900mb in size. I can send it via dropbox if you give me an email address to use. k' Sent you an email. Most of the engineers and QE are out next week for the holiday. Is there anything in particular, such as a Gaussian Blur filter, that you use right before the corruption occurs? If you don't mind me asking...what is the image size / document size before you save it? Also, sorry to be nosy, but Is there a reason for the file size being 900mb - I've worked on magazine layouts, double page spreads and the files haven't been anywhere near this size. This may seem a harsh statement, that is why I ask about the reasons for the dimensions. Jeanne, thats a good question. It doesnt always happen in the middle of editing a file. I can save a file a come back to it the next day and the problem appears. I do usually edit in the same order of steps, and the problem will show at any time during the process. So, I don't recall using a specific tool right before. Derek, The files I work with are usually from 21-22mp cameras so thats like say 5500x4300 document. I work in ProPhoto RGB, 16bit, 300dpi smart object settings which will make a flattened PSD 50-70mb. Add 10-30+ layers and it becomes 500mb-1.5gb in size. Kyle, I tried a few test files with roughly the same specs as you've mentioned and they turned out fine, even using various filters to put Photoshop through its paces. Each time they turned out fine (I tried 8bit and 16bit and various connotations and Photoshop came up with the goods). In my experience, things like this usually happen when the files are being written to disk, whether it be CD, DVD or HD which makes me agree with Chris. It points toward the problem being maybe hardware, but nothing major, maybe lack of storage space or a "cluttered" hard drive. A quick scan and/or a defrag should throw some light on the situation, especially if this has only happened recently. ran a hardware test and it actually found an error. so....I guess Ill take it in. Sounds like a RAM problem, which could lead to artifacts like you saw. I called OWC and they sent me replacement ram. I swapped the ram out and ran another test. No errors found. I have been using PS for about an hour so far with no problems yet....I'll keep you posted. Excellent. Sounds as though you've fixed it. Normally the ram would process all the information to and from the CPU and your hard drive, so if it weren't operating properly then the info saved from Photoshop and possibly other programs would end up corrupt. Good luck. Possible causes: bad GPU, bad video card driver (more likely on Windows), bad RAM, bad hard disk. Dropbox could only cause a problem when saving and loading, not while the document is in memory. What's really strange it's that it is my very first time ever on this machine (is this the end ? ), and it happened while uploading the image on dropbox. Further edits on different files never showed anything like that. Oh, and of course i won't be in front of it for the next week... Sorry Chris. What are your photoshop preference performance settings? Please note that this is not a display problem. If the file is saved and opened (even on another Mac) the image data ist still corrupted. OpenGL speedup option is already set to disabled. Image data corrupted, OpenGl already deactivated..
System is a factory new MacPro with 10.6.8 and all updates installed. Photoshop is CS5.1 (with all current available updates). RAM checked no problems found (using Apple hardware test). Similar Effect happened on multiple workstations. This is an issue we're currently looking into. Could you contact me directly at jrubbo AT adobe DOT com? Thanks! 5 years on, has Adobe finished "looking at this"? It's still randomly happening to me in new PS. Hi Rob, do you have consistent steps to reproduce? Are you saving locally or to an NAS or server? Are you using a file syncing services? I had a similar problem after installing a solid state hard drive that I used as a scratch disk. This increased performance substantially, but I would get crazy corruptions like this. Im having this same issue, have you figured it out Matt? Hi, I have the exact same image corruption problems. I have been updating my architectural portfolio and am seriously frustrated with this issue as Photoshop has ruined some of my digital archives. Some of my images look just like the first one in the post, with the horizontal bands of inverted color or shifting. I have copies of my portfolio backed up on external hard drives, and in some instances an image will be corrupt on my computer's copy of the portfolio, but is still fine on my external hard drive. 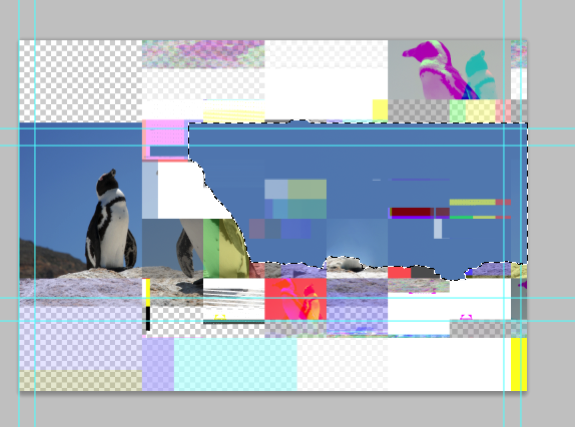 I am suspecting an issue with Photoshop because that is the only connection between all the corrupted images. 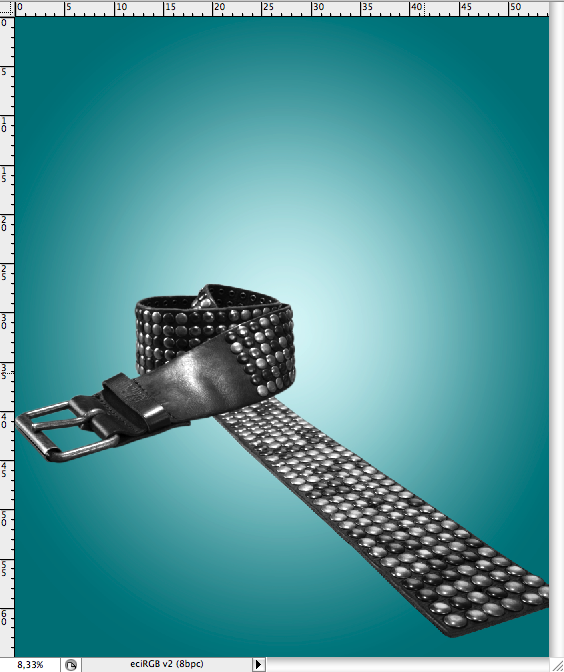 Also, sometimes InDesign pulls the image with significantly less corruption than what Photoshop displays, there will still be some horizontal lines in the image, but not the whole bands. I feel like the corruption should be reversible... since it seems like all the data is still in the image, it has just been scrambled. Has anyone found a fix? @kyleburdg : Have you had any further problems after swapping out the RAM? We have this problem too, file totally ruined. Tried saving it locally and the best guess we can make is its the smart object, blur theory. However it is only happening on one mac that has a unreliable past. Using CS5.1 and working over a network which has also raised questions. 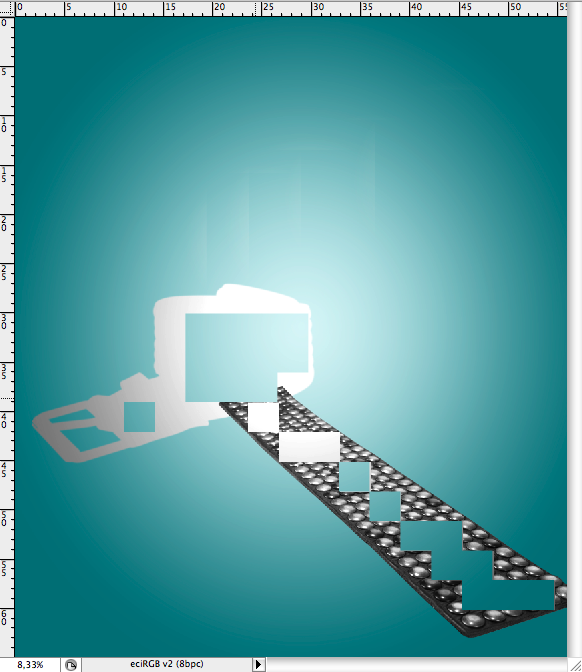 I get this corruption randomly, but always when trying to use gaussian blur, completely shatters the file. We've never gotten steps to reproduce the problem with GBlur. And we've spent a LOT of time trying to reproduce it, but never have. Some other people do see similar corruption due to corrupt bits on disk (including problems with network servers), bad RAM, or bad OpenGL drivers causing display problems -- so we have to walk each person through troubleshooting to determine the probable cause. Thank you all for your input. I am in the same situation. It started june last year, it comes and goes but there are a lot of similarities when this happens. (smart objects are present, drop shadow and blur effects are consistent when the image gets damaged, after reading this post i will be checking the RAM and the video card. so at least i can say i try everything. Some interesting data i found was that if you work in RGB Profile the Blue channel is the one which originates the damaged image, in CMYK is the yellow or Magenta, a quick taht had worked for me to recover the image is to recreate the part of the channel that is damaged with the information in the other channels keeping the black & white values as the rest of the channel (just like clonning) (curves, levels, brightness & contrast had been my tools to fix those images that i do not want to loose, but it is a pain and time consuming process. Well, I upgrade my RAM and the Video Card and Voila!! Problem solved! I went ahead and made a copy of the pictures into a flash drive and open them in another computer, then open it back to my new RAM/VideoCard Upgraded Computer and I was able to get the images just as I wanted them. I have not seen the problem for over 6 months since i did that. Hope this helps. I too am having this issue. It happens randomly but this last episode was 5 mins ago (see attached: top image is corrupt / below is original) and happened on GBlur. I've had quite a few major art files destroyed on me. At this stage I'm constantly making duplicates + backups of my PSDs because once the file corrupts, the whole file and all it's layers are f**ked. I was having other issues with my MacBook Pro and brought it to Apple for repair months back. When I described the issue, they blamed the logic board, which has since been replaced but the PS issue still persists. It's a disaster really. I'm very unimpressed with Adobe + CS5. Has anyone noticed it in CS3 or other? I can't carry on with this. All my illustrations are digital. 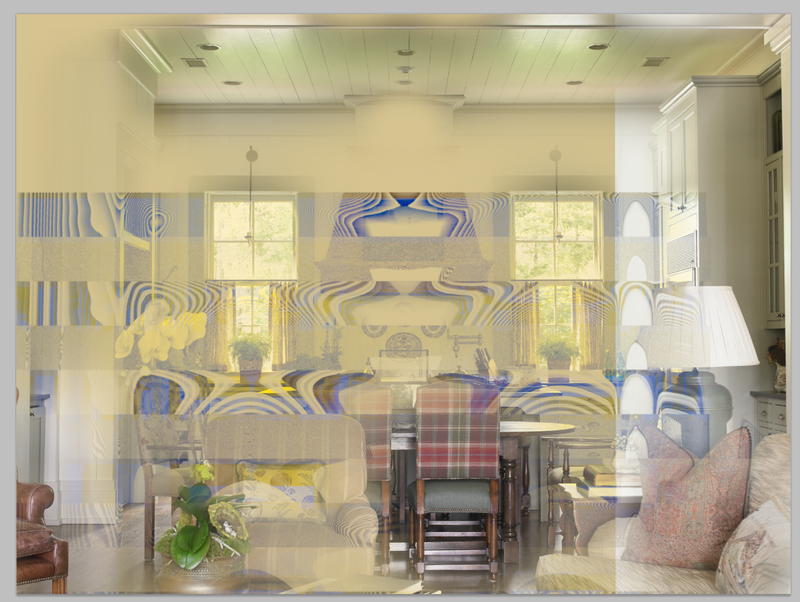 All that you could do for CS5 is minimize use of smart filters with filter masks. If you see transparency on other images, then it probably means some problem with the GPU or it's drivers. I want to say a word to the "myth" of gpu related image problems: When you disable OpenGL there shouldn't be any image obstructions, and even with OpenGL enabled, the obstructions should only be a matter to the actual display of the data, not the data itself. The image data shouldn't be messed up at any case. In the past, image error occured because poorly working OpenGL drivers on some systems/gpus. I consider this a major bug, and the fix should be "back ported" to CS5 or CS5.5, or leaving it useless in my eyes. Hardware problems can be application specific, in that the application may be the only one using a particular hardware feature. And yes, GPU problems mostly go away when disabling GPU drawing in Photoshop - but some remain because they're in the general display codepath for the OS. I am currently using CS6 as I pay per month and I am getting the same problem? No, the problem covered in this topic was fixed in Photoshop CS6. There are GPU problems that look similar, but are not the same problem. I am having the same problem, specially when I use a victor smart object, did you guys find a solution, and have I lost my file now? the problem happened to the image in the background. i'm having this problem as well, it seems to be limited to embedded smart objects as far as i can tell. sometimes when i open the smart object it won't be corrupted and i can save it out and re-embed it and work around it. has there been any new information on this? This issue is present on the latest release of the Mac version of Adobe Photoshop CC (2014). It permanently corrupted two reasonably complex PSDs today. What is the current state of this issue and how can I assist Adobe in resolving it? 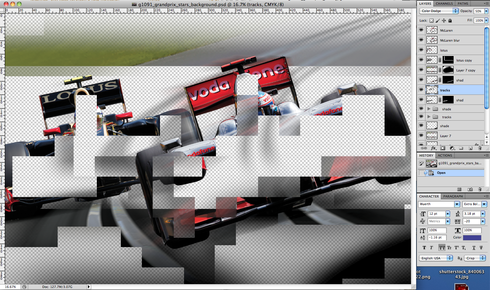 This particular issue was caused by smart filters on smart objects, and was fixed quite a while ago (in Photoshop CS6). We have not been able to reproduce it since, but have had customers with third party plugins corrupting memory, and some bad video card drivers producing similar looking artifacts. We're not running any plugins beyond Adobe Bridge CC, and there's no evidence of GPU issues on this fresh out of the box machine. The Large Document Format PSB was created natively on Photoshop CC 2014 and was not round-tripped through CS6 or CC. Visually, the corruption exactly matches other examples seen in the last five years on this forum: blocks punched out (almost artistically!) across much of the document... raster image layers having large blocks removed from them... transparencies applied willy-nilly. Rolling back the history does not solve anything, and Photoshop does not report the image as being corrupted. OSX Console shows nothing. It would certainly make sense that the GPU screwed up somehow, but it doesn't make sense that the source document is thereby corrupted. The damage is visible in the thumbnail and present in CC and CS6. The layer stack looks normal but the layers themselves are shredded. Are there tools or techniques for picking apart a PSB? I would love to help find out what went wrong so this doesn't eat another day's work. That corruption appearance is what happens when almost anything is corrupted in memory or in the display pipeline. No, there are no user tools for dissecting a PSB file. And once it's written to disk, the corruption is baked in and the file information becomes useless. If you have CC 2014.1, I don't know of anything that could explain such corruption within Photoshop itself. In the initial CC 2014 release, there was a problem with the color palette that could cause some corruption, but that was fixed in 2014.1. Ah, so PSB is kind of a serialized thing instead of a bundle of items. If -any- file damage creates the same glossy box spangle party this makes a whole lot more sense. Monday I will absolutely confirm that we're using CC 2014.1. Here's an angle: both documents were being edited live on an AFP server, not locally. I am -thoroughly- willing to entertain the notion that the server was responsible for barfing on some save sequence. Is Adobe's current stance on live network editing still "Don't do it"? If that's the story, there's a reason this happened and I can change the workflow so my guys are editing locally. Damage to the PSB file on disk would cause a wide variety of errors. Yes, we still don't support editing over a network - there are still too many OS and server side bugs to call it reliable. But file damage is unlikely to explain all of what you are seeing. Boo! Unfortunately that's the only theory I've got for two documents being edited live on the server corrupting at the same time on the same machine... either the GPU mangled them both simultaneously or a network save over AFP failed in some key way. Thank you very much for your time, it is greatly appreciated. I recently had a similar experience where there was inexplicable corruption to the my placed linked images. These are vector based graphics that were imported as smart objects, and additionally converted to smart objects (so that I can apply smart filters and gallery blur effects). I was able to determine that the original source files are not corrupted but the views of these PSB files were. To repair the work, I double-clicked on the PBS files—which opened up a new PSD window showing the original placed vector graphic—and made an edit (like added a blank layer, then deleted it), and saved the file. It created a new UNCORRUPTED representation. I manually performed that task to each PSB file that appeared corrupted. Layer masks were also corrupted. There is no known simple solution for repairing those masks. Fortunately in my case, layer masks were simple shapes, so they were corrected by either recreating the masks or deleting unwanted masks. I was about to turn in a brochure. 4 different documents were corrupted when I last saved them yesterday. What is being done about this? This is extremely frustrating.